The first election was set for April 6, 1869, at the house of S. A. Wolcott. The township was organized as Oxford in accordance with the wish of the petitioners, but a year later (May 10, 1870) the name was changed to that of St. Olaf by the commissioners. St. Olaf was organ­ized as a civil township the year following the organization of the county and was the second township organized, being officially formed by the com­missioners just five months after Clitherall. This township lies on the south­ern border of the county and borders on Grant county. 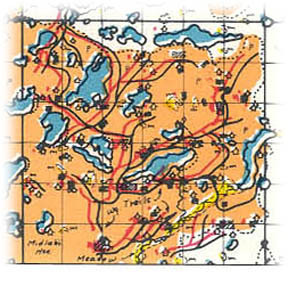 It is bordered on the north by Tordenskjold, on the west by Tumuli and on the east by Eagle Lake. It was settled by Norwegians, as were most of the southern town­ships of the county. The early settlers to this county came from the south and settled along the southern border first, although some of the townships through which the Northern Pacific railroad was built were among the earliest. St. Olaf lies in the lake district, although it is at the southern border where the lakes are small. There are some thirty odd lakes in this township, but only seven worthy of mention. Lake Johnson is the largest, with Lakes Sewell, Jolly Ann, Vinge, Sonner, Johannes and Lacy following in the order of their size. There are only four sections, namely, 12, 28, 32 and 33, which do not contain a single lake within their limits. Very few of these lakes have outlets. The land in this section of the county is very rolling and broken. The farms are rather small and the township is well populated. There were two Lutheran churches in sections 20 and 21, respectively, as early as 1870. At present there are churches in sections 7, 12 and 21. There are cemeteries located in sections 20 and 23. There are six school districts in the townships with school buildings in sections 7, 11, 18, 20, 23 and 35. The town hall is located in section 21. There was a postoffice, called St. Olaf, located in section 2, for a number of years, but the rural route has caused this to be abandoned. There has never been a village platted in the township. The present township officers are as follows: Supervisors, T. M. Sal­vevold, chairman; H. H. Berge and Martin Norby; clerk, N. E. Thormodson; treasurer, L. A. Boe; assessor, K. N. Sonmor; justices, N. E. Thormodson and E. N. Bystol; constables, Anton Veaasen and O. A. O. Vinje. Places of birth for St Olaf Township in the 1905 state census.